B. was great fun, thank you Joe! A perfect example of refinement and taste. Always grateful for your refined taste, thank you so much Marcelo. A good portrait of lady who makes the best of her lovely features, nicely dressed and a kind smile for you Patti. She enjoys her smoke too,unashamedly so. And why not? Life is so short. A great shot of a nice lady. 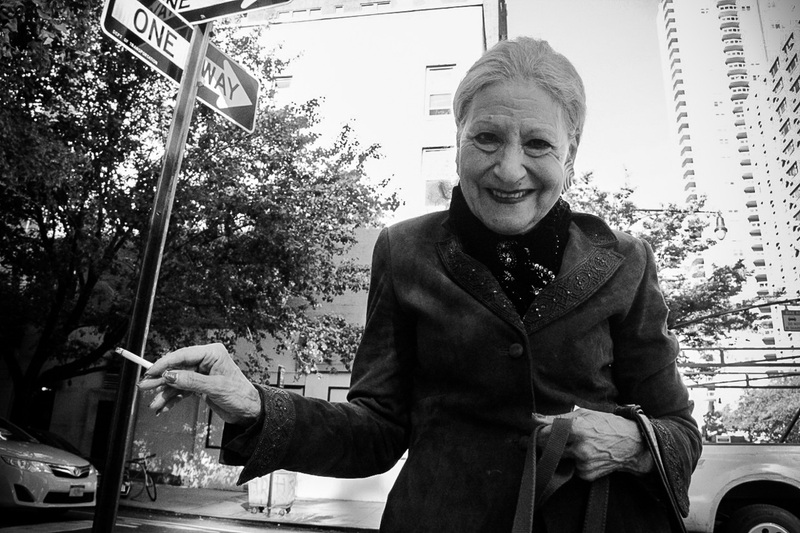 She enjoys life still and the cigarette is an extra bonus. If only smoking weren’t so bad for the health . . . . she reminds me of the times when it was the height of sophistication. Nice portrait, but I’m interested in your angle. Are you sitting on a bench? Thank you Lignum! I was crouching down taking shots of her sweet little dog, talking to B. at the same time and somehow managed to get this one in the process. Your street photography continues to amaze. Nice, Patti! Love it! And it’s endless on the streets of NY. Lovely – I imagine a small Bichon or fluffy white dog…what kind of dog did she have?